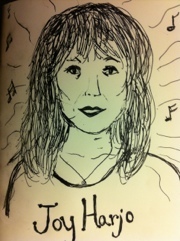 I had the good fortune to attend both a reading and a workshop given by poet, musician, and writer Joy Harjo. She came to the 41st annual Agnes Scott Writers Festival as a poetry judge, and she chose my work as the winning poem. In the Agnes Scott theater, Harjo enchanted the audience with her poems, her children’s story, excerpts from her newly launched memoir, and Polynesian songs she sang and played on a ukelele. Although the reading was joyous and celebratory, there was an undercurrent of mourning, because Joy Harjo had dedicated the night to her poet mentor and friend, Adrienne Rich. The next day the poetry finalists met with Ms. Harjo to talk about our poems. She asked us to share what we thought were areas where we could strengthen our work, and she offered suggestions for revisions. She admitted to the group that she was very much saddened by the passing of Adrienne Rich, and that the previous night’s dedication to her beloved mentor had taken a good deal of emotional energy. She encouraged us to accept that death is real and that young poets should not succumb to the allure of suicide, as many poets and artists have done in decades past. Of course, I am not a younger poet. I am a newly public writer who is not young. But some of the other finalists were in undergraduate writing programs, and a few of their poems were quite melancholy. It was good for all of us to hear Harjo’s wise words.